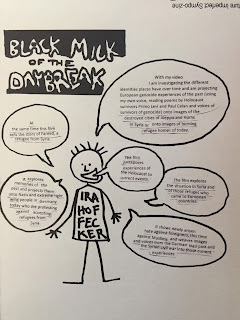 This last month I travelled to England to go to the Future Imperfect Symposium to contextualize my video Black Milk of Daybreak which was screened in the cinema of Plymouth University. I had a chance to talk for about 15 minutes about the video. The symposium was a great experience. A day full of interesting keynotes, talks and discussions, screenings of almost twenty 5 to 15 minute videos and workshops. Of all those exhibitions Richard Mosse’s video was one of the most relevant exhibitions for me. Mosse had filmed refugees that were rescued in the Mediterranean Sea by other big ships. He filmed his video with an infrared camera so that the viewer cannot see the skin color of the people shown in the video. I was sceptical about this intention, the video alienated refugees in a way and made them more ‘strange’ or foreign instead of showing that these are people like everyone else, only they are not in a safe place and take on this journey during which they risk their lives. The images through were overwhelming and the installation was done very well. Three videos running simultaneously next to each other on huge screens. There were no interviews or any voiceover, just very loud sounds. The piece was very impressive. 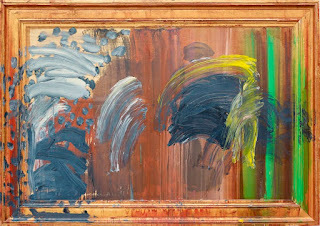 I loved Howard Hodgkins work, so bold and courageous. Unfortunately I was not allowed to take photos. But here is one of my favourites. The show that absolutely blew me away was Ibrahim Mahama’s installations at the White Cube in Bermondsey. The artist has worked with this material for many years, on the huge white walls of this gallery the pieces have a great impact. They remind of Anselm Kiefer’s work. Mahama talks about the economy in Ghana. There was a huge installation of hundreds of shoe boxes, but the most striking are the sewn together jute sacks. Very powerful work. During the last two weeks in March I had started the following painting. I would love to discuss this with Andrew next week when we meet on Skype. In contrast to my Structure IV painting I feel the composition does not work so well. It seems way too busy and the eye movement does not work so well. Initially I was inspired by the color palette of Agnes Martin, but then decided to add further colors. I think the brown on the first layer is a very difficult color and the map of the Scheunenviertel is too dominant in the background. It makes it to a ‘field painting composition’ and at the moment I am not sure how to solve the composition. I realize that now, that the elements of the film are broken down I need to spend a lot more time to find new and more material to make the individual films work better. I think I need to carry on with this project in the second year. The article I wrote recently for ‘Art Avenue’, the Federation of Canadian Artists publication, was published at the beginning of April. Here it is. “I was born in Germany and my work talks about the different identities places take on over a period of time”, into their first paragraph, but oh well. I am happy about the promotion of my art. I thought that those wall hangings were Keifer pieces! I'm eager to get the Tate now after seeing these shots. And so I'm wondering, what if you were to make another series of paintings that take their cue from these lichen forms you're drawn to; what might happen in a very different series where there's not necessarily the bold geometric lines and angles and diagonals, but a different means of generating space in the visual field. For ex, later in the lichen video there are some shots of these rock surfaces with a repeated, gentle rhythm quality, and other lichen fields that are stippled with texture--a soft blanket of crackles. 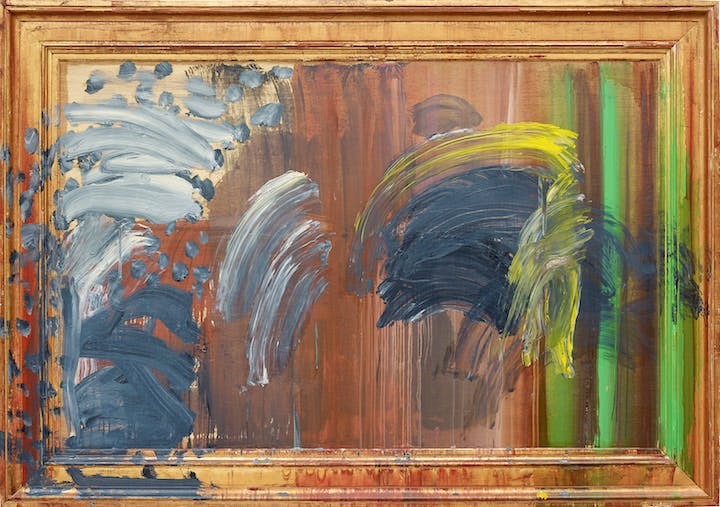 You're such an organic painter, drawn to the physical quality of the textures (I recall shots of your earlier work you showed us a while back--I think you working with tar or dripping metal or aluminum or something outside?). I'm not saying there's anything about the geometric/organic mix that doesn't work for me, not at all. Just wondering if there's yet another door of possibilities w/your name on it, and all these photos of organic, non-geometric lichen forms might be nudging you in that direction as a parallel course. I'm also very much aware of how in some of your work the base or underpainting, so to speak, literally or figuratively references concentration camps or landscapes saturated with horrors. Might these lichen shots point to a more utopian or eutopian project--abstract, layered visual fields that directly or indirectly evoke the other side of the fence. Not memories of incalculable horrors but renderings of possibility, joy, peace, or (fill in the blank). Just thinking out loud, as always. If nothing else, maybe we can talk some time about how you see the video projects and photography interacting (if at all) w/the painting? I especially like the close-up shots of this painting--your work is the kind that makes me want to get up very close to the canvas and spend time checking out the contrasts and textures.